Our most recent creation, Tsuru brooch has just been complete. In our collection so far, we have had a few items that are inspired by motifs of animals, such as Polar Bear brooch and Deer. This is the very first time we are attempting a bird, and not just any bird, but the symbollic Japanese crane, an epitome of elegance. The crane has been a popular motif for traditional ornamentation throughout the fashion history of Japan, and to date, the folded paper crane seems to have taken over as a popular abstract motif in many contemporary designs. 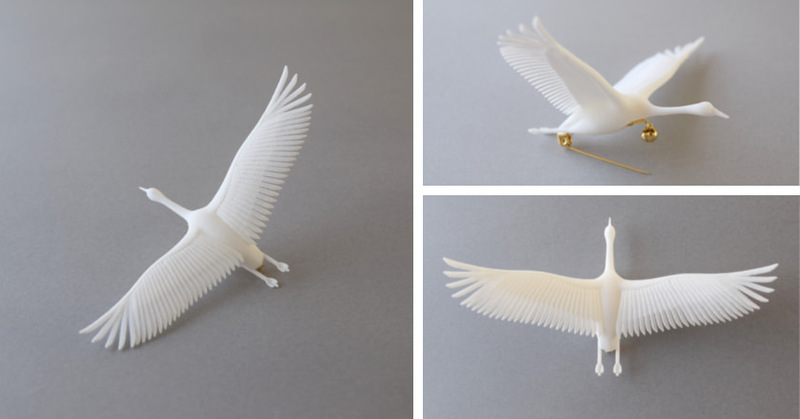 To reminiscent and emphasize the beauty of the real crane, we created this work, representing the bird in a pose as it glides and rides on winds, which best features its signature tiny head on a long, slender neck on a rotund body, skinny legs with a majestic set of wings. This item is no doubt a wonderful match for traditional Japanese kimono but its traditional symbollic charm also works beautifully with contemporary fashion styles. This item will be lauched for sale from April 1, 2016. And the launch will be announced on our newsletter, so do keep a watch out for it!